Hundreds of rubber loons, the first and only ones in the world, will return this month for the third annual Loons and Logs event at the Adirondack Interpretive Center (AIC). The event will be 9 a.m. to 5 p.m. May 24. Loons and Logs celebrates the human and natural history of the Adirondacks by using the spring traditions of bird migration and logging drives as touchstones for educational programming. It is held at the AIC, which is part of the Newcomb Campus of the SUNY College of Environmental Science and Forestry (ESF). This year's schedule will feature presentations and hands-on activities about migratory songbirds in the Adirondacks, traditional Adirondack woodworking workshops and demonstrations of traditional timber sports by the ESF Woodsmen's Team. In addition, the AIC will launch its "Summer of Art" program featuring Artist-in-Residence Frances Gaffney. The events culminate with the one-of-a-kind race called the "Loon Drive" at 3 p.m. 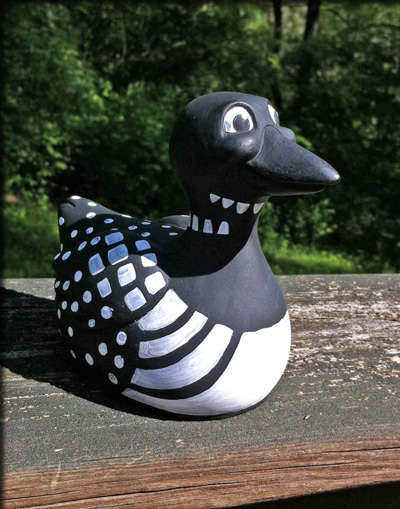 The loon race made history in 2012 as the first race of its kind to use American-made rubber waterfowl, with the first batch of 1,000 loons custom-made for SUNY-ESF by CelebriDucks of California. The competitors have since been dubbed "Lila Loon." Prizes will be awarded to those who sponsor the top-finishing loons. The top prize is an overnight stay for two in historic Huntington Lodge, a William West Durant great camp owned by ESF and renovated in 2009. Additional prizes include a private, half-day guided tour for two of the ghost town of Adirondac and the McIntyre Iron Works, and a half-day guided tour for two of the human and natural history of Rich Lake from ESF's restored 1902 guideboat Beaver. Additional prizes include gift certificates and goods from local restaurants and businesses. All proceeds will support educational programming at the AIC. For additional information on the race and other Loons and Logs day events call the AIC at 518-582-2000. ESF is again partnering with North Country Public Radio, the official media sponsor for Loons and Logs.